Highway #1 from the City of Santa Cruz. However, looking at our paper map, we spotted Big Basin Redwoods State Park. We on the Scampy RV Team love redwood trees! So, this morning after breaking our Nite Camp, that's where we will head out to! After our visit to Big Basin Redwoods State Park, we plan to head to Half Moon Bay which is along Hwy #1. We like that mysterious sounding name [Half Moon Bay!]. The Scampy Team has arrived at Big Basin Redwoods State Park. We have setup Scampy in campsite #48 [A trailer site]. 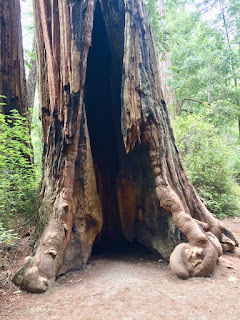 George and Little iPhone took a walk together on Redwood Trail [An easy trail for seniors]. The largest redwood tree in the world is here. 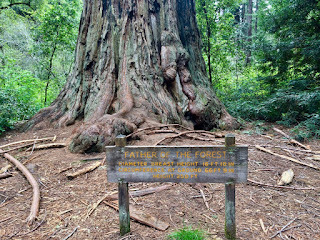 It is named Father of the Forest. 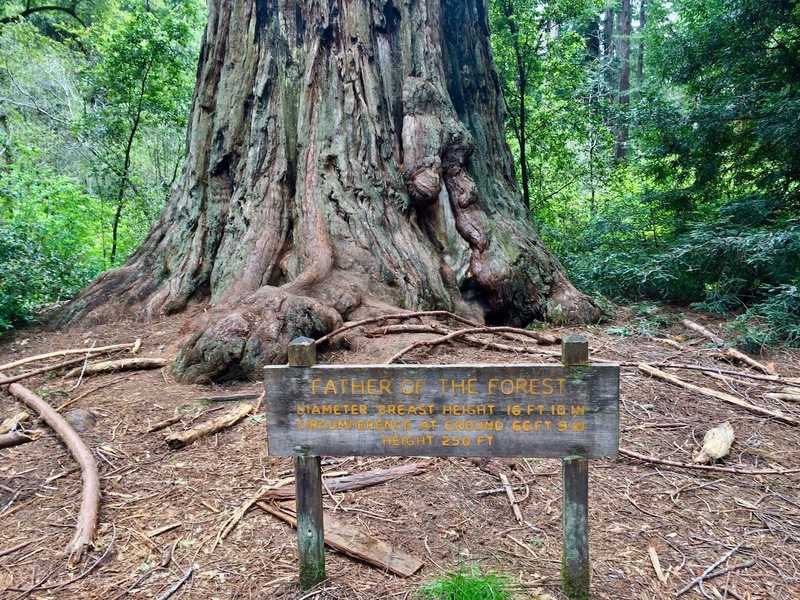 It is estimated that the age of Father of the Forest is 1,800 years. Note: You may be wondering why Little iPhone captured a pic of the base of Father of the Forest, and not the entire tree? That's because most of this enormous redwood tree is not visible. Too tall! The redwood below is named, The Chimney Tree. Forest fire burned away the lower part of the tree and also burned a hole going up thru the trunk all the way to the tree top! The road into the park from our Nite Camp is State #236. We were very surprised to learn that this highway is CLOSED from Big Basin to State #1 [Coast road]. Be nice to know at the BEGINNING of State #236 that this road did not go thru. When we leave Big Basin, this closure means that we will return all the way to the beginning of State #236 in order to visit Half Moon Bay. Sounds like a great place to explore, hopefully some nice photos. I drove up highway 101 years ago tenting all the way into Vancouver, BC. I loved NW camp sites...most had hot water for showers but the mosquitoes were deadly. So I recognized Half Moon Bay. We ate at mom/pop restaurants...the fruit pies were out of this world, apple, peach, blueberry, blackberry, huckleberry! We also ate smoked salmon, lots of sea food and salads. The beaches in Oregon were endless...sign I wish to do that again one day. Have fun and be safe. Isn't Half Moon Bay where they filmed The Birds? Didn't you camp there a long time ago? You took a picture of yourself inside that tree... right? I don't remember camping in Big Basin Redwoods a long time ago. But I don't always remember stuff like that.